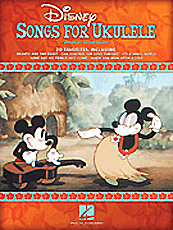 20 great Disney classics expertly arranged for ukulele by Jim Beloff. Includes: Beauty and the Beast • Bibbidi-Bobbidi-Boo (The Magic Song) • Breaking Free • Can You Feel the Love Tonight • Chim Chim Cher-ee • Circle Of Life • Heigh-Ho • It's a Small World • Some Day My Prince Will Come • Supercalifragilisticexpialidocious • We're All in This Together • When You Wish upon a Star • and more. For GCEA tuning. Notated melody with lyrics, chord symbols and chord diagrams. 48 pages.